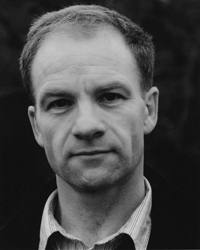 Actor Adrian Rawlins, who has been playing James Potter as an adult throughout the film series beginning with Sorcerer's Stone, will complete his role as Harry's father in Harry Potter and the Deathly Hallows, as listed on his agency's website. James was most notably featured in the seventh installment of the series during the very pivotal walk Harry had to make through in the Forbidden Forest before meeting Voldemort in The Forest Again chapter. SQUEEEE!! I am so glad they are keeping him on as James!! Hearing all of this is getting me more excited to see the movies! Oohh! Yay! I can't wait to see Harry's walk into the forest. It's going to be so... sad and depressing, espacially with Harry's parents. I can't wait to see them, and to have Sirius come back for the last film! Eekk! I think I'm going to absolutely love that scene, even though it'll be so depressing! He looks different, but then again, it's been almost 10 years. Good for him! Also note that Geraldine Somerville's profile at imdb.com has been updated, telling that she is currently filming for DH Part 2 as Lily Potter. Last edited by Enrico_Dc; 11-30-2009 at 04:31 AM. Reason: update with info. Yay! James! I can't wait for this scene since it was one of my favorites in the books. He's a bit too old for the role even in the first movie, because James was 21 when he died. But alright, it doesn't need to be perfect, I always have to tell myself that. Anyways, that scene is one of my favorites in the book so I can't wait to see it! I bet it will be great! I never really liked him as James. James died at 21 and he looks way older than that, even in the first movie. I think they could do better but I guess I'm just glad that they will have a james at all. The Forest Again is my absolute favorite HP chapter ever! I am sooo looking forward to that part! Good! I don't like when they get new people to play the characters were used to seeing. By the way- 354 days until Deathy Hallows 1!! But he's so old! James was 21 when he died! He looks too old! Sorry, that's probably mean...but still. I am so glad they cast him and they are doing the walk in the forest...... I CANNOT WAIT FOR THAT SCENE!!!!!! SOOOOO Excited!!!!! he's older than James definitely, but it's ok , I can't wait for the movie!!!!!!! I like that scene soooooo much. I'm so glad he's still James! I'm very glad to see him again. He's very good James Potter. I can't wait for DH!!!!! they'll have the same actors At first I thought they would use the School actor, the one who made Snape fly up, cus it said they all looked younger during that scene? The actors that they have to play Lily and James Potter are far too old now. Lily and James were only in their early 20s when they died. We know she is but her agency hasn't confirmed it. There was a rumour that they might use the younger actors from OotP but I guess this confirms that won't happen. YES! God I'm so happy, Adrian and Geraldine are such pivotal characters in the entire Potter universe, and they never get the credit they deserve.